This tag says "You are the Write teacher for me!" and can be customized with any teacher's or staff member's name. 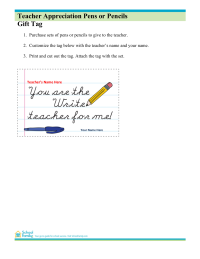 Print out then attach a tag to a set of pens or pencils as a small gift during Teacher Appreciation Week. This tag says "Orange you glad it's almost summer?" and can be customized with each teacher's or staff member's name. 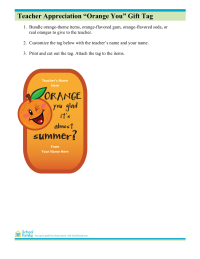 Print out then attach a tag to orange-theme items, snacks, or real oranges as a small gift during Teacher Appreciation Week. This tag says "Thanks for being a berry good teacher!" and can be customized with any teacher's or staff member's name. 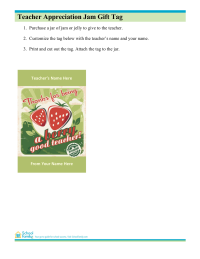 Print out then attach a tag to jam or jelly jars as a small gift during Teacher Appreciation Week. This tag says "You are oFISHally the best!" and can be customized with any teacher's or staff member's name. 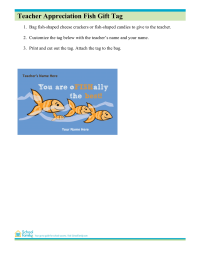 Print out then attach the tag to a set of fish-theme crackers or candies as a small gift during Teacher Appreciation Week. This tag says "There's no erasing everything you taught me!" and can be customized with any teacher or staff name. 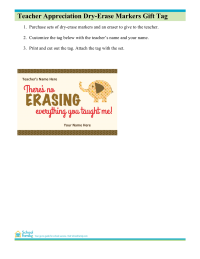 Print out then attach a tag to a set of dry-erase markers as a small gift during Teacher Appreciation Week.